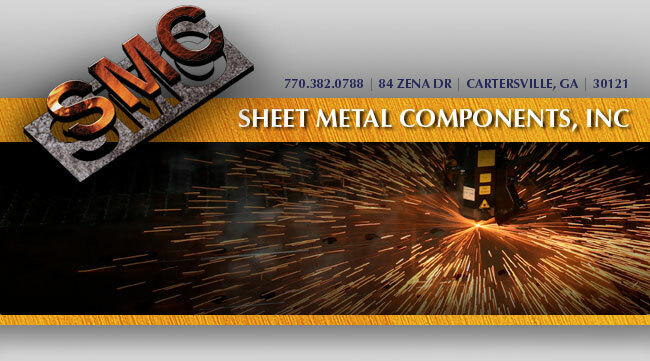 Sheet Metal Components, Inc. is a contract metal fabricating company. We provide custom-built components, fabricated to the customer's specifications that are an integral part of your product. We typically work with carbon steel, galvanized or pre-coated steel and aluminum, plain aluminum of all alloys, high carbon and high tensile steels, and stainless steel. Our laser cutting occasionally takes us into plastics, rubber and wood. Our capabilities allow us to approach each job with the most economical means of making the quantity of parts required, in the material specified. From laser cutting thick materials or small quantities, through the thicknesses and quantities ideal for turret work, to the larger quantities and sizes ideal for stamping, we cover the entire range. Besides the operations and services indicated by our equipment list, we also offer parts with finishing processes such as painting and plating. We also do 4 roll CNC rolling for multi complex radius parts. Our company is owned by our employees. Each employee has a vested interest in the quality of the parts produced. From the time we negotiate the contract with the customer and order the materials, through delivery of the parts to the customer, quality control is an ongoing process. Verification of Q.C. functions required is agreed upon at the issuance and acceptance of the contract for work to be performed. Sheet Metal Components, Inc. exists primarily for the livelihood of its employees. We are a team that earns our individual livings by our group efforts, producing high quality parts for our customers at competitive prices. Our philosophy is simple: Sell quality parts – deliver them on time – promise only what we can really do – do what we promise. If our capabilities match well with your needs, we would like to have the opportunity to work with you.